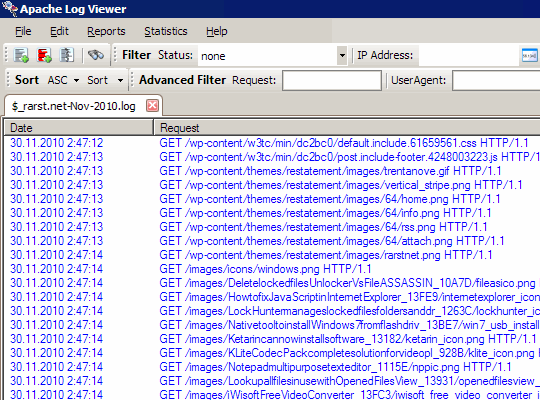 Apache Log Viewer is software to navigate, filter and interpret web server’s logs. App opens empty and then you can open logs. Files can be either plain text or compressed with gzip (as older logs often are archived on servers), but compressed log just gets unpacked to same directory so it’s not much of a feature. There are several common log line formats to choose from or you can define your own if log is customized (or maybe not from Apache server at all). Interface is usual and fitting multi-column view. Set of column to display can be customized in preferences, rows are color-coded (by response status) and can be sorted and filtered by using toolbars on top. Viewer gets server-specific stuff right. Color-coding is very fitting and it is easy to navigate and slice results. Instead of opening whole log it is possible to open specific date range. Even if loading large file interface remains very responsive. It was a little confusing at first that app only opened about a day worth from the end of log. Turned out that it defaults to last 2MB of log, which can be changed or disabled in preferences. And limit is there for good reason. While loading full log (I tested with ~300MB monthly one) it starts to burn through available memory real quick. Reports pretty much stop working with out of memory errors and I even pushed it to crash without much effort. While app doesn’t really have free/paid versions, most of report-generating capabilities are locked and unlock code is provided for donating money. Solid and flexible tool for looking into smaller time periods, but unsuitable for processing large log files.